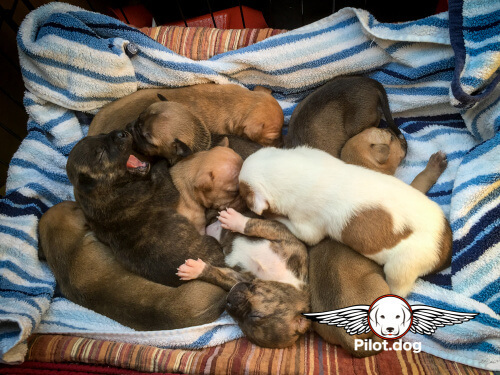 More puppies sleeping on the Pilot.Dog flight. 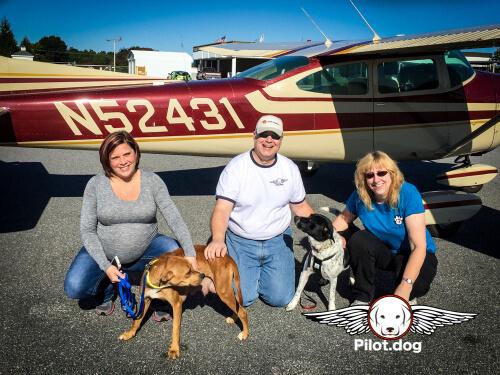 This flight and the saving of these dogs, who would have otherwise been killed for lack of shelter space, was made possible by our amazing supporters and patrons who help us out for as much or as little as they can afford. If you are not yet a supporter, click here to learn more. 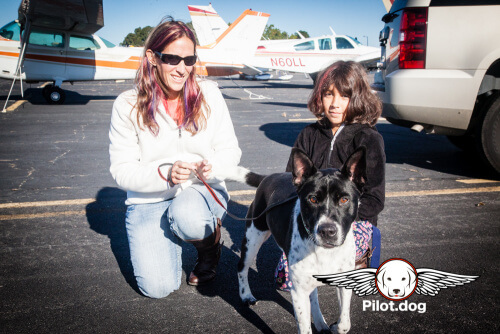 Nancy a volunteer from Granville County SPARE (Shelter Partner for Adoption, Rescue & Education) and her two super cute daughters brought Danny, a Border Collie Mix, to meet us at Triangle North Executive Airport. Danny is a happy and playful dog. He’d never met Nancy and her daughters until that morning and he was quickly rolling around and playing with them as if he’d known them forever. Danny was at the Granville Animal Shelter in April of this year but his owners came and got him. 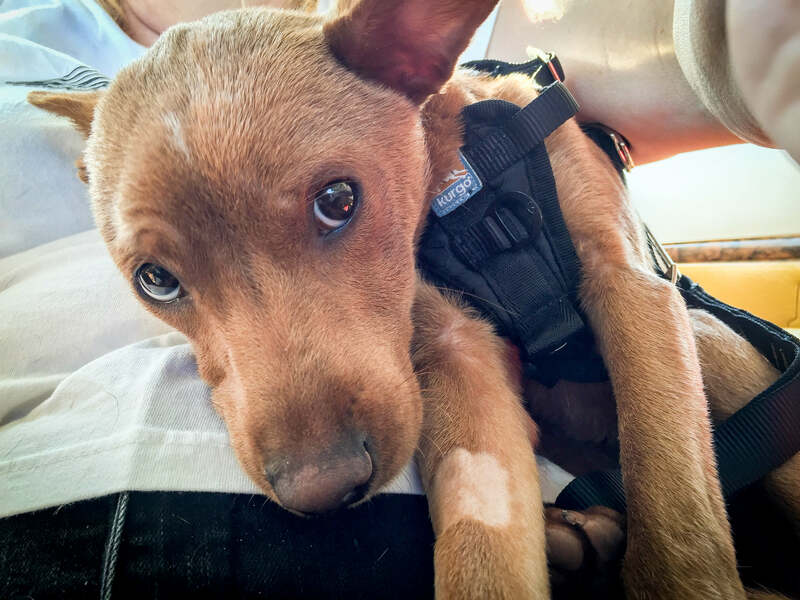 In May, Danny was hit by a car and was found on the side of the road with a laceration on his leg. He was taken again to the shelter. This time his owners didn’t want him or couldn’t afford to treat him and told the shelter to euthanize him. That’s when Granville County SPARE came in and took Danny, they paid for the surgery on his and found a foster family that took care of him while he recuperated. We did not meet the foster family but they deserve massive hugs. 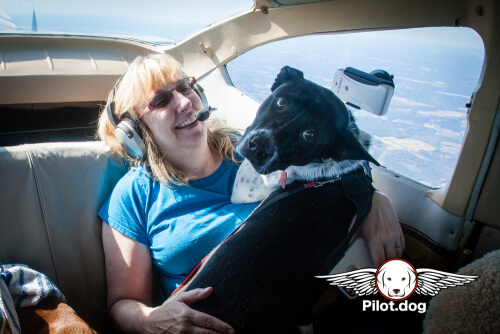 We were flying Danny to LaMancha Animal Rescue in Union, PA. From what Laurie at Granville County SPARE told me, he would be better able to be adopted by a good family because LaMancha makes sure that the animals and new owners are compatible before going through the adoption process. It’s a step that not every shelter put a ton of effort into. 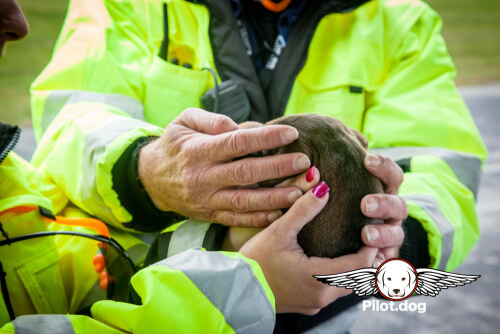 Danny was a great passenger and insisted in sitting on Pam’s lap and pressing his head into her. 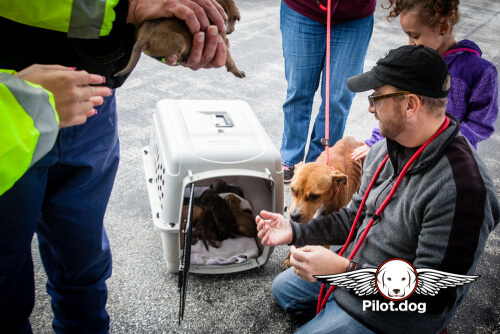 We flew to Rocky Mount, NC where we picked up Amber and her nine, 4-week-old puppies. 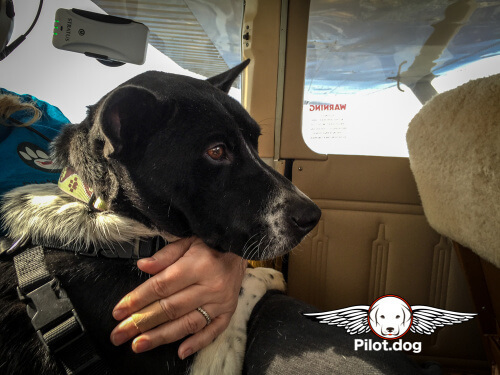 We were a little concerned that Danny and Amber may not get along very well so we thought that Amber would sit in the copilot seat up front with Steve. Well, that was the plan at least. Amber had other intentions. You’ll see what happens in the video. 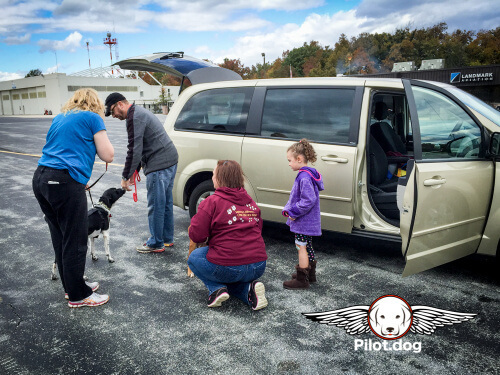 When we arrived at the Rocky Mount airport, where we met Abby a volunteer from the SPCA Alliance of NC who brought Amber and her puppies from Tarborro, NC. Abby herself was 9 months pregnant, and was so happy that Amber and her babies were going to a facility that would be able to take great care of them. Danny and Amber didn’t mind each other and got along well. Everyone had tails a wagging. 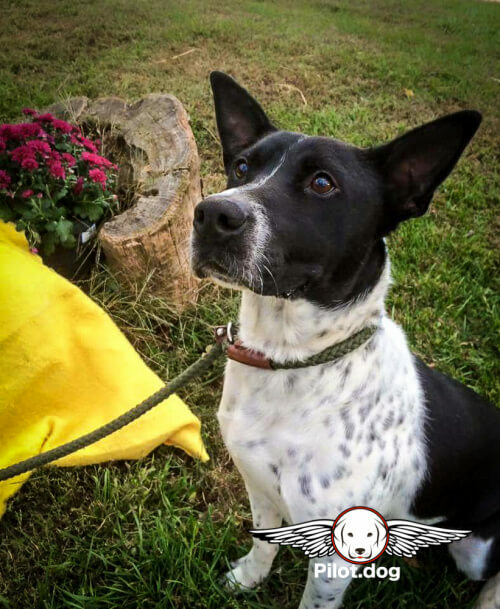 Amber was surrendered by her owner shortly after she gave birth to her pups. We are not sure exactly why but obviously the sudden explosion in dog family size was unmanageable by the previous owner. Amber was so thin and scared. She reminded us of the dogs you see on TV when the SPCA is looking for donations. 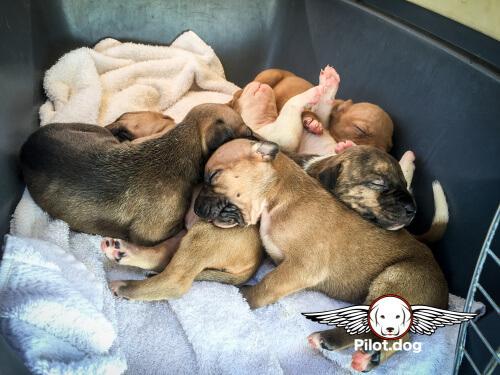 The SPCA shelter were afraid of all the disease that could run in a shelter and wanted to make sure the young pups could stay out of that environment. that the puppies would get something that would be life threatening. So Peggy who runs the SPCA Alliance contacted LaMancha to take Amber and the puppies so that they could get proper medical supervision. 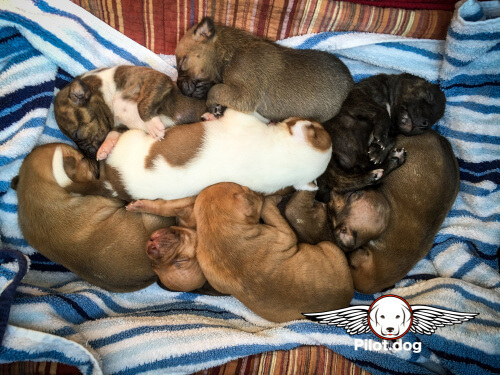 The precious puppies slept through the whole process and stayed cuddled up together to stay warm. 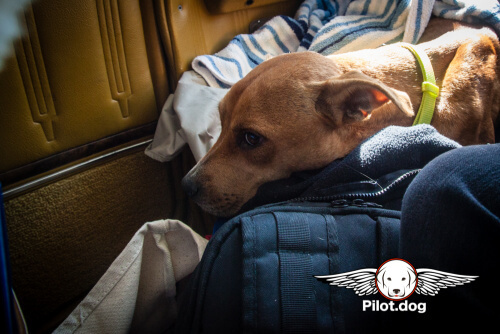 It got a little chilly in the back of the plane but Pam kept a constant vigil on them to make sure they stayed warm and put a towel over them so that they could keep their warmth in. 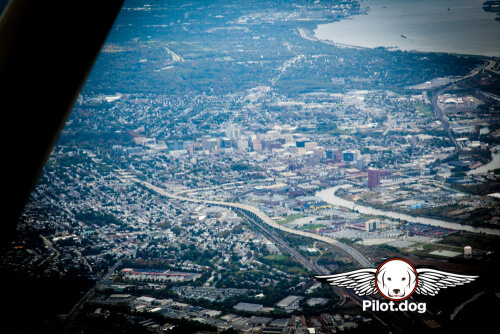 Amber originally sat in the front seat of the plane, up with Steve as co-pilot, but shortly after take off she decided to come in the backseat with Pam and Danny. 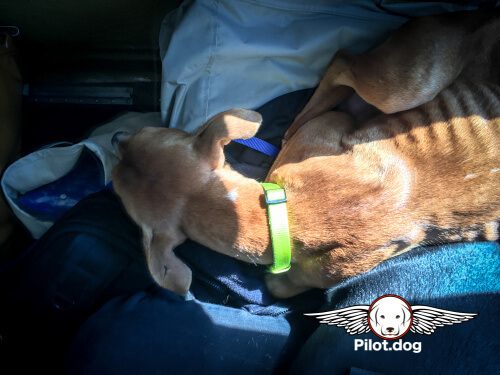 She curled up next to Danny and he lounged across Pam for the flight. It was an unusually cold October Saturday and the higher we flew the colder it got. 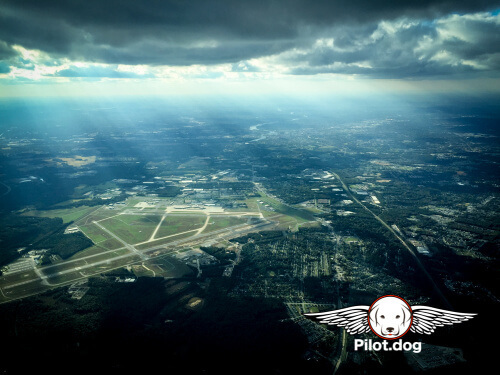 Because we were flying with young puppies we didn’t want to go above 5,000 feet. 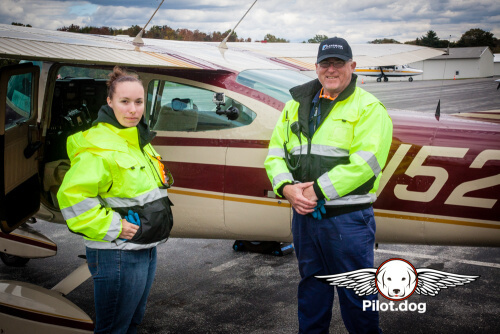 Pam covered up Amber with a warm jacket that she gave Amber in flight. Danny was a little heating dynamo and he kept Pam warm throughout the flight. Danny cuddled with Pam but Amber was more interested in just sleeping next to them both. When we got to Chester County, G.O. Carlson Airport in Coatsville, PA we were met by several of the Landmark Aviation line people who were working the field that day. 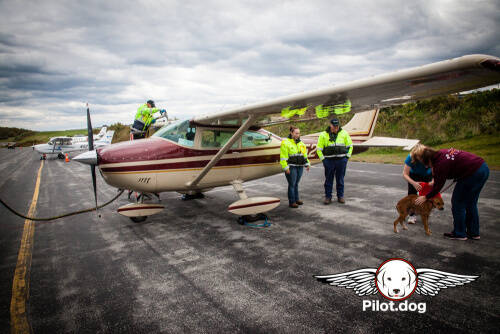 They were so nice and helpful with getting the dogs and puppies out of the plane, we couldn’t have done it without them. Alan and Cecilia, volunteers at LaMancha and their little girl met us at the airport. What wonderful, and compassionate people they are. 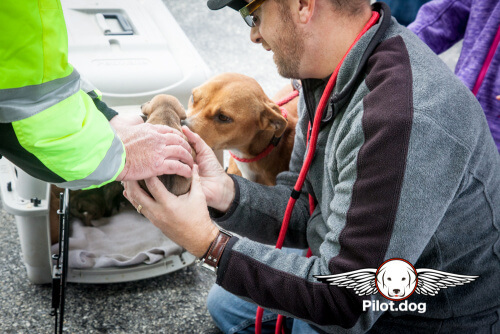 Sometimes it can be difficult handing off the dogs you’ve become attached during flight because you don’t know what type of situation they are going into. But Alan and Cecilia are two of the nicest people we’ve come across. 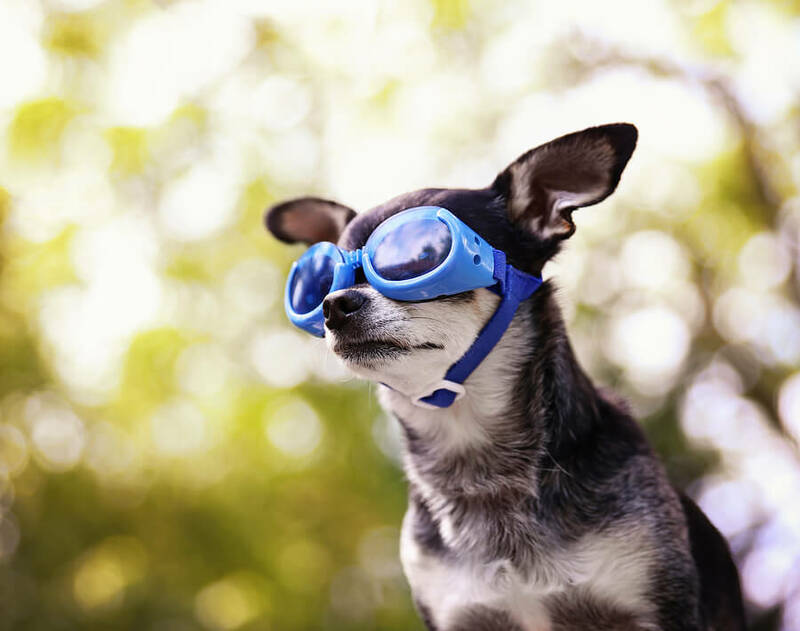 Its so heartwarming to find people who love and care about the animals like we do. 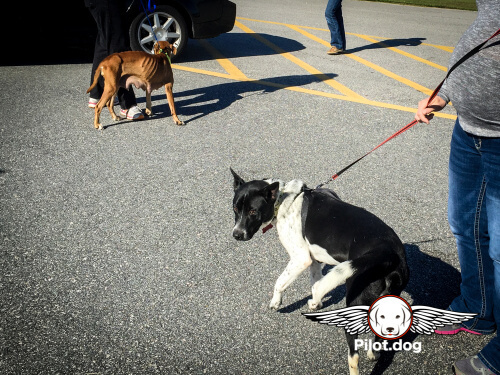 We got Danny settled into the car then it was time for Amber’s babies to make their exit from the plane. 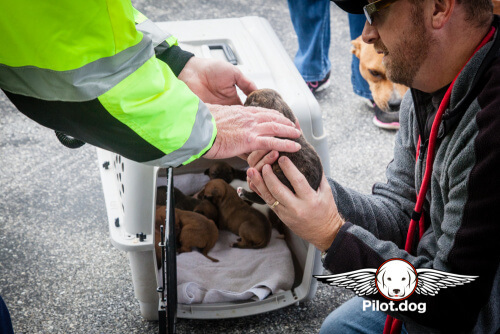 We had a human conveyor belt going where the line people helped us with handing the puppies one at a time to Allan and he carefully put them in the crate as Amber supervised. 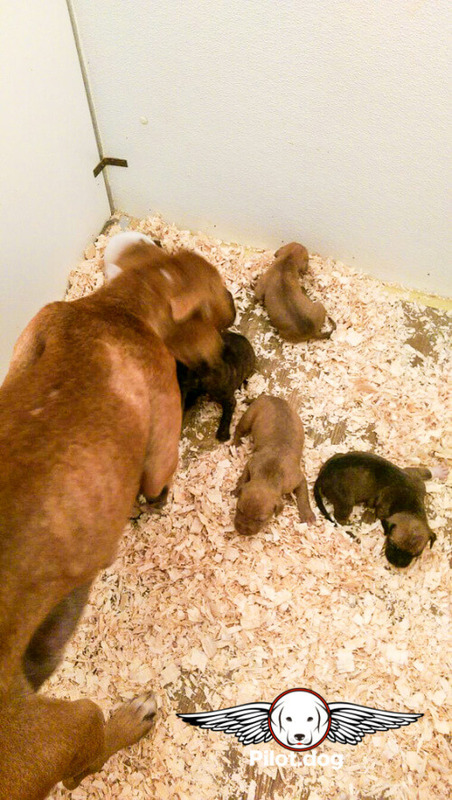 Amber was right there with us sniffing each puppy to make sure they were ok. She is such a good mama. 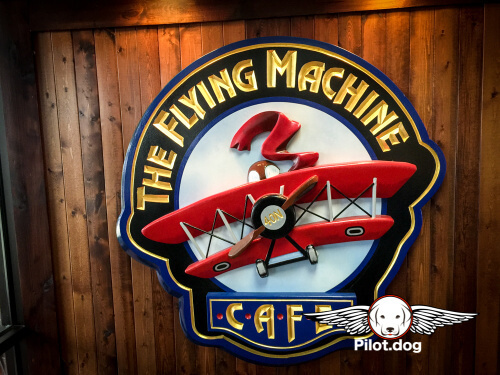 Soon the dogs were off and we jumped into The Flying Machine Cafe for some amazing food. 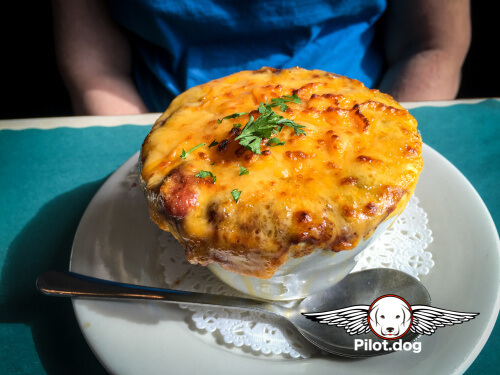 It was seriously good and it you are in the area, you absolutely need to go there for great comfort food and a fun airport atmosphere. Then it was time for us to say our goodbyes. 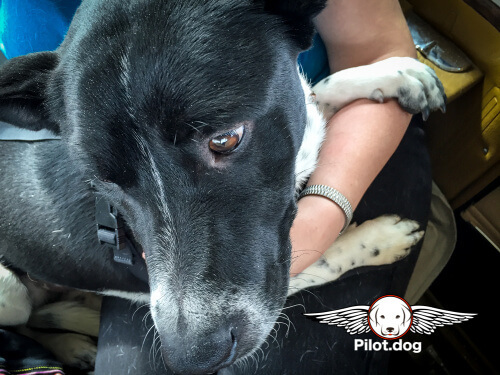 Pam had really gotten attached to Danny during the flight and as usual cried as we left. 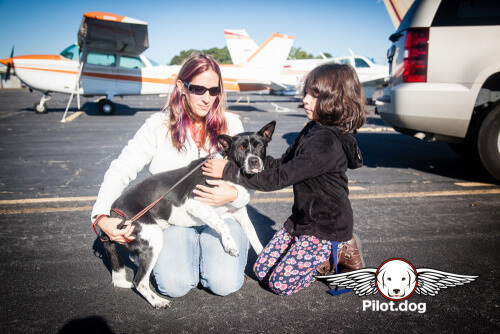 Cecilia has sent several pictures of Danny and Amber at the rescue and they looked happy. We’ve added the pictures as bonus material at the end of the video so be sure to watch the whole thing. Everyone is doing great. Several of the Volunteers are in love with Danny, he such a good dog. And Amber is such a sweetheart you can’t help but fall in love with her. They are making sure she eats three meals a day plus they’ll give her hot dogs and mac and cheese to help fatten her up. Cecilia didn’t think that Danny would be there long because he would be adopted rather quickly. And Amber has to be there for the pups for a while longer plus she needs to get her health back before she can be adopted. Danny and Amber meet for the first time. 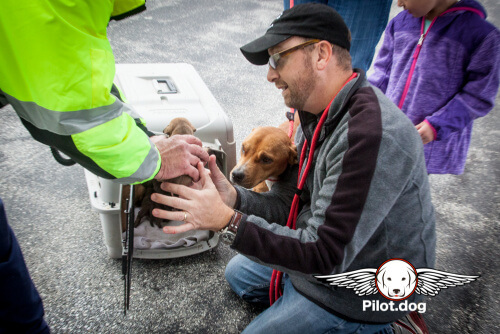 Puppies in their carrier before their Pilot.Dog flight. Amber get comfortable in flight. Skin and bones Amber finds some time in flight to sleep on the Pilot.Dog plane. 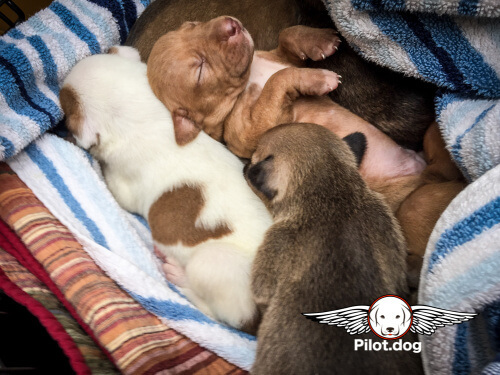 Puppies sleeping on the Pilot.Dog flight. Danny looks around but holds onto Pam. 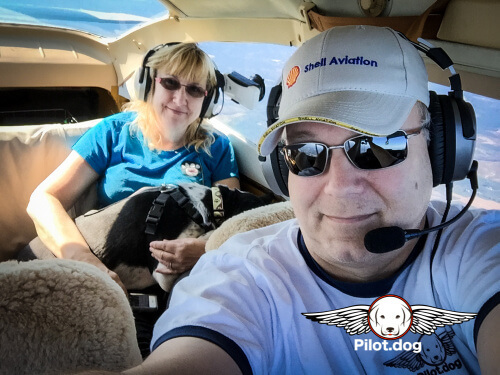 Pam and Steve on a Pilot.Dog rescue flight. The incredible line crew at Landmark Aviation at KMQS. 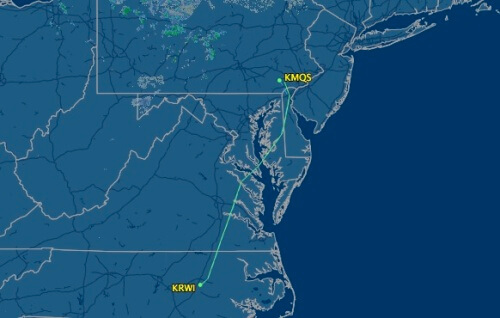 Time to pass rescue puppies from the plane to the carrier. 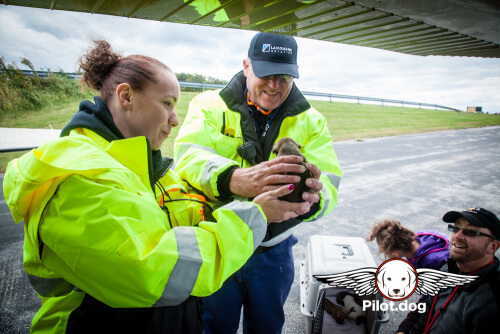 The Pilot.Dog puppy unloading is nearly complete. Amber gives her puppy a nuzzle or kiss. 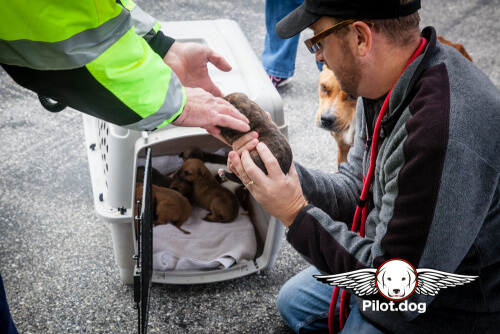 It was loads of puppies that had to be safely unloaded. Amber checks to make sure all is well with this puppy. Amber is keeping a close eye on the puppy passing operation. 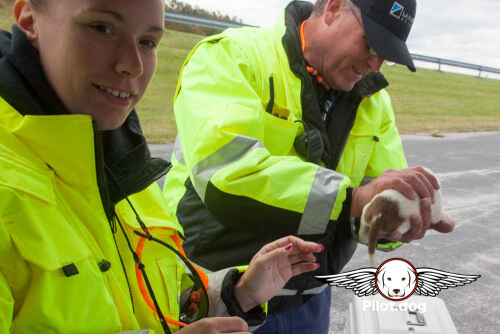 Alan accepts another puppy from the line crew. Amber supervised as her puppies emerged. 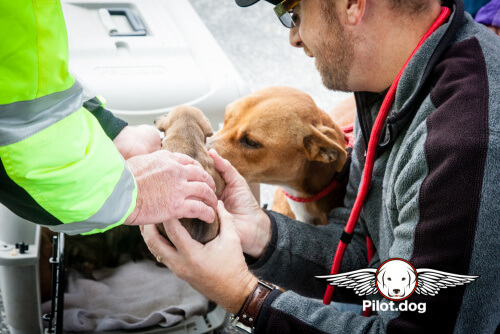 More puppies coming out of the Pilot.Dog airplane. 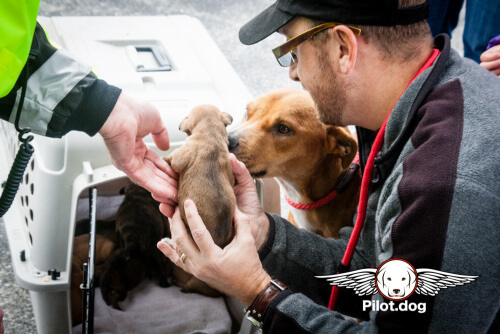 Carefully passing the 4-week-old puppies from the Pilot.Dog plane. Danny prepares to jump in his ride to LaMancha. 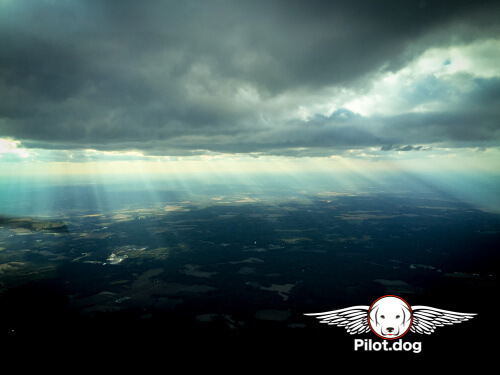 Beautiful sun rays in flight. 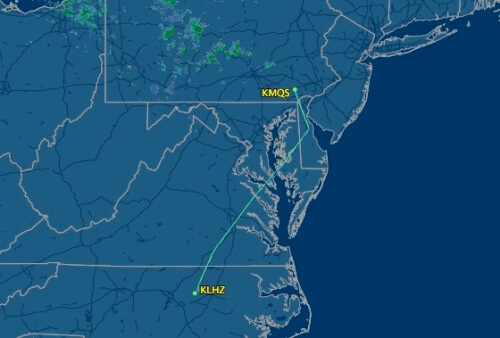 Ominous skies on the flight back home. Danny settles in at the LaMancha shelter. Amber at the LaMancha shelter, shortly after she arrived.